If you like Japanese food - and for this purpose I don't mean sushi - then take yourself to East 47th Street between Fifth and Third Avenues. These three blocks host at least three excellent finds for Japanese food lovers. Onya serves freshly made udon, thick Japanese noodles, with any number of additions, including chicken, beef, curry, tempura, kimchi and my personal favorite, kitsune (a thin pillow of flash fried and then blanched tofu). The texture is authentic - toothsome but not al dente - although I like a little more body to my udon, and so is the taste. At peak times, there can be a bit of a wait, since the takers-out and the diners-in share the same assembly line where they choose their ingredients. There is a pleasant, bright eating area in the back for those who prefer to consume their udon on site. Onya, 143 East 47th Street. Everyone knows tempura, but not everyone knows that the Japanese are great at frying a broader range of items. 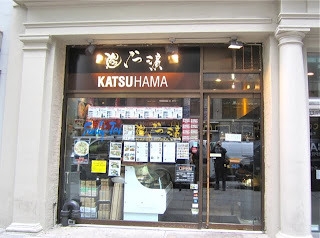 Katsuhama serves a full range of katsu (fried) dishes, traditional ton-katsu (pork), chicken katsu and ebi-katsu (shrimp). The lunch special is a fantastic deal - excellent miso soup, choice of pork or chicken katsu, pickles, cabbage and rice for just $11. The non-prepossessing front section of Katsuhama is a busy take-out store, but the restaurant in back is pretty pleasant. Being alone, I sat at the nicely designed counter. 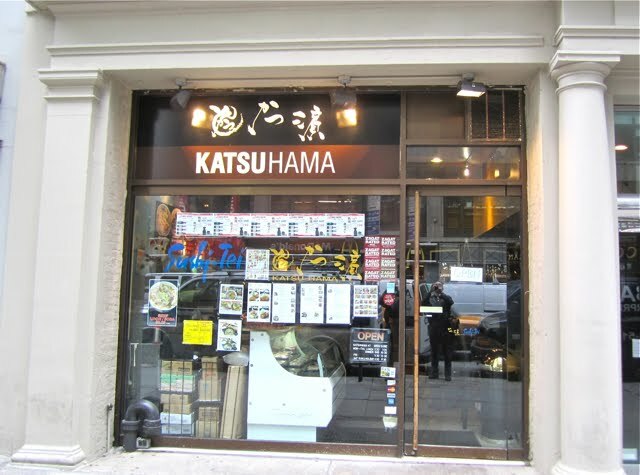 Katsuhama, 11 East 47th Street (there is a second location at 43-45 West 55th Street). Want to cook Japanese at home? Then head for Dainobu, a Japanese grocery store, which stocks a broad range of Japanese sauces and prepared foods - miso, pickles, sembei, noodles, tea, etc. They do a big take-out business, selling onigiri (rice balls), freshly made ramen and various bento boxes. 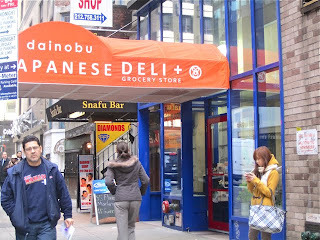 Dainobu, 229 East 47th Street. 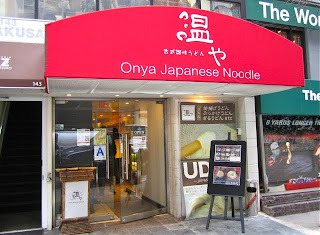 I said at least three good places, because there is also a restaurant called Donburi-ya (rice bowl place) next door to Onya, which may be good. However, I have not tried it and cannot express any views. Before I was a Francophile I was an Anglophile. 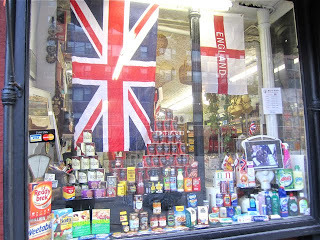 So when my friend Suzie, who is English, told me about Myers of Keswick, an English food store in the West Village, I raced to get there. 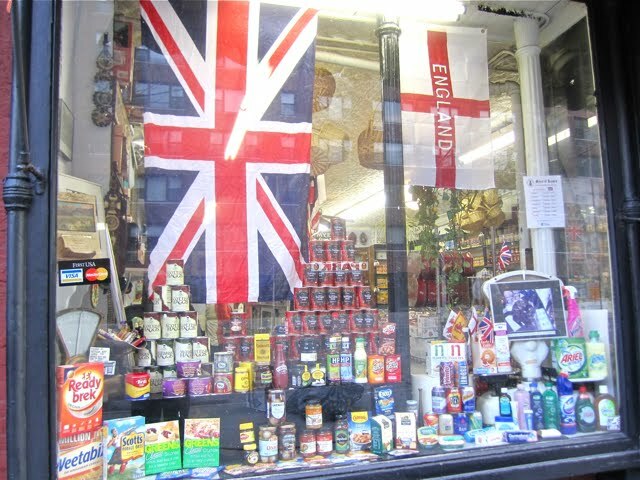 It's a small place, with an assortment of traditional English packaged foods - Branston Pickles, HP Sauce, Marmite, etc. 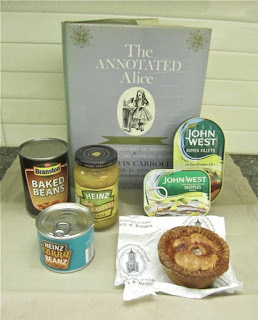 - as well as a selection of homemade meat pies and a few uncooked fresh meat items, including bangers and Irish style bacon. Things that are not necessarily the greatest delicacies in the world, but that do remind you of England and its quaint food traditions, and certainly a must for English expats. Needless to say, I bought a few items (pictured below). Myers is located at 634 Hudson Street, between Jane and Horatio Streets.